Proofs of these three designs exist in black, in colors very close to the issued colors, and in other colors (scarce). The 10 øre pictures the Kronborg Castle in Elsinore (Helsingør) which is usually considered a lighthouse issue by lighthouse topical collectors. 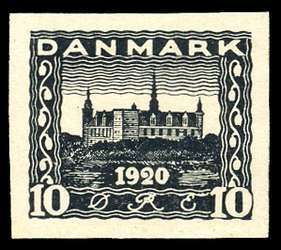 Scott #156/159 [1920-21 10 øre Reunion issue: Kronborg Castle (The location for Hamlet and including what most collectors include as a lighthouse)]. Plate proof in black on thick yellowish, smooth paper. A very attractive and inexpensive plate proof and a key item sought by lighthouse thematic collectors. 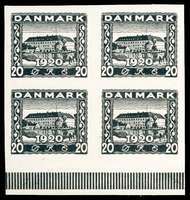 Scott #157 [1920 20 øre Reunion issue: Sonderborg Castle]. Plate proof in black on thick yellowish, smooth paper. A very attractive and inexpensive plate proof. 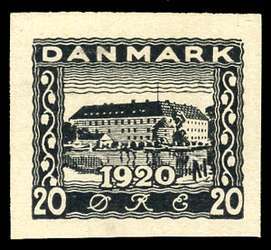 Scott #157 [1920 20 øre Reunion issue: Sønderborg Castle]. Plate proof in black on thick yellowish, smooth paper. A very attractive and inexpensive plate proof. Lower sheet margin (with pressure bearer lines) 4-block. Nice position piece! Priced the same as four singles! 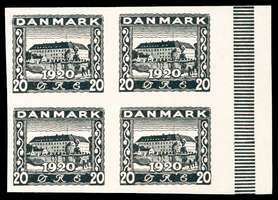 Scott #157 [1920 20 øre Reunion issue: Sønderborg Castle]. Plate proof in black on thick yellowish, smooth paper. A very attractive and inexpensive plate proof. Right sheet margin (with pressure bearer lines) 4-block. Nice position piece! Priced the same as four singles! Scott #158/160 [1920-21 40 øre Reunion issue: Roskilde Cathedral]. Plate proof in black on thick yellowish, smooth paper. A very attractive and inexpensive plate proof, though this denomination is somewhat scarcer than the other two. 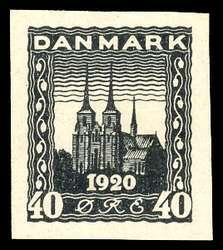 Scott #158/160 [1920-21 40 øre Reunion issue: Roskilde Cathedral]. Plate proof in black on thick yellowish, smooth paper. A very attractive and inexpensive plate proof, though this denomination is somewhat scarcer than the other two. Lower sheet margin (with pressure bearer lines) 4-block. Very unusual position piece! Priced the same as four singles!